Anniston City Hall is located at 1128 Gurnee Avenue, Anniston, AL 36201; phone: 256-236-3422. Photo: Richard P. Huger House, ca. 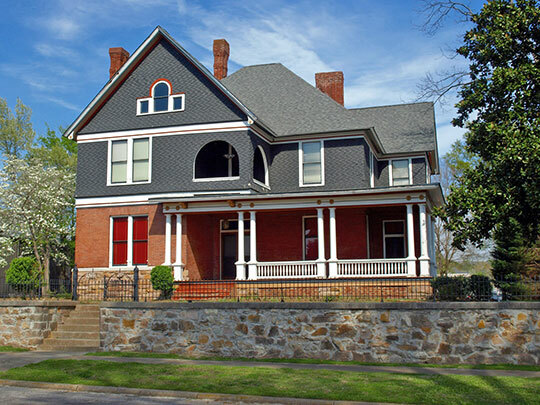 1888, 1901 Wilmer Avenue, Anniston, Alabama. Listed on the National Register of Historic Places in 1985. Photographed by user:Chris Pruitt (own work), 2014, [cc-by-3.0 (creativecommons.org/licenses/by/3.0)], via Wikimedia Commons, accessed June, 2014. Anniston is situated in the northeastern part of Alabama between the thirty-third and thirty-fourth parallels in the rolling hills of the Piedmont region not far from the highest point in the state: Cheaha Mountain. Early observers noted that Anniston was nestled in the foothills of the Blue Ridge Mountains in a bowl-shaped valley surrounded by hills in what in the 1870s was considered to be the finest mineral and agricultural region of the Southeast. An abundance of iron ore, rolling hills of longleaf pine for charcoal, and good railroad connections first attracted Samuel Noble and Daniel Tyler and prompted them to form the Woodstock Iron Company and undertake in 1872 the production of charcoal iron and the development of a private town to support the operation of the company. The original town limits of Anniston comprised a circular area with a radius of 1.5 miles. The central point is near the intersection of Noble and Seventeenth Streets, and had already been decided upon when the town was incorporated in 1873 by the Probate Judge of Calhoun County. George Noble, considered to be the engineer of the Noble family apparently laid out the streets of the new town in the early 1870s. The grid plan adhered to the compass points, with Noble Street being the major north-south artery. East-west streets were numbered. Noble Street runs along a section line, passing through the center point of the town, and being the highway that connected Anniston to the older settlements of Jacksonville to the north and Oxford to the south. Noble Street, one of the most level areas of town, was designed as Anniston's "Main Street" the focus of the central business district and the dividing line between the east side and the west side of town. According to tradition, when land sales opened up to the public in 1883 Major General John H. Forney — a West Point graduate, civil engineer, and Confederate war veteran from Jacksonville, Alabama — drew the plat maps and divided the lots. The town's founders planned for business, manufacturing, and residential sectors, but they also perceived an occupationally segregated town. This was achieved by creating a commercial area centered by Noble Street, an industrial sector west of Noble with each industry surrounded by adjacent operatives' cottages, and an elite residential section east of Noble Street. A pragmatic reason exists that must have been the persuading factor in their choice of location: topography. The hilly region in the southwestern area of the town contained the iron ore beds. The ore lay close to the surface and was mined in open cuts from ten to twenty feet deep. Mule-drawn carts carried the ore to the furnace, located around Seventh Street west of Noble Street near the railroad tracks on a site now occupied by Adelaide Mills. Operatives lived in nearby Glen Addie, a model residential village. The path of the railroad through the town determined, along with the relatively level area in West Anniston, the location of many of the new industries. For example, the first cotton textile mill, Anniston Manufacturing Company, was built in 1880 by the tracks close to Eleventh Street, with a mill village adjacent to the west. Grace Gates and Michael Bailey, Alabama Historical Commission, Multiple Resources of Anniston, Alabama, nomination document, 1985, National Park Service, National Register of Historic Places, Washington, D.C.